About 1910 the King Ranch of Kingville, Texas, one of the largest ranches in the United States, became interested in the possibilities of using Brahman cattle to improve the performance of the range cattle in their area. Tom O'Connor, who obtained some Bos indicus cattle from the Pierce Ranch in Pierce, Texas, gave a half blood Shorthorn-Brahman bull to the King Ranch. He was mated with a group of purebred Shorthorn females. All male calves from this cross but one, a red bull called Chemmera, were castrated and the heifers were turned out with Shorthorn bulls. In the fall of 1918 about sixty descendants of the O'Connor bull and his son were placed in a high quality pasture and their performance was such that the Kings Ranch became interested in crossbreeding Shorthorns and Brahmans. Since no purebred Brahmans were available, the King Ranch secured fifty-two of the best three-year-old bulls that they could obtain from the Pierce herd. These bulls were three-fourths and seven-eighths Brahman. The bulls were divided among eight different herds with a total of approximately 2,500 Shorthorn cows. Two bulls were specifically selected and pasture mated to fifty cows each. These bulls were referred to as the "Chiltipin" bull and the "Vinotero" bull. One of the females in the Vinotero bull's group was a milk cow with one-sixteenth Brahman blood that she carried as a descendant of the O'Connor bull through his son Chemmera. The result of this mating was a bull called Monkey, who became the foundation sire of the Santa Gertrudis. All present day Santa Gertrudis descend from Monkey. The name of the Santa Gertrudis breed is from Rincon de Santa Gertrudis, the name of the original land grant purchased by Captain Richard King from the heirs of Juan Mendiola. This land grant is where the first headquarters of the King Ranch was established. In 1940, the United States Department of Agriculture recognized the Santa Gertrudis as a purebred. Modern Santa Gertrudis cattle are approximately five-eighths Shorthorn and three-eighths Brahman. A deep cherry-red color has been established in the breed. The breed shows a relatively high degree of both heat and tick resistance. Their characteristics include ease of calving, good mothering ability and abundant milk supply. They also show very little evidence of a hump and have improved beef quality over most purebred Brahmans. Steers can be turned off at any age depending on environment and conditions, and are noted for their weight for age and ability to achieve high weight gains both on pasture and in feedlots. There were 283 herds recorded in Volume I of the Herd Book. 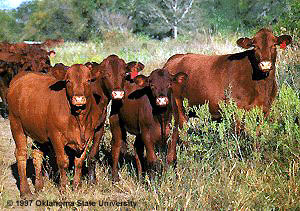 The King Ranch herd was designated as the Santa Gertrudis Foundation Herd. Other herds that had attained the purebred status by continuous grading up were designated as Foundation Herds. An official classifier of the Association inspects Santa Gertrudis and classifies the females as either certified or accredited and certified for bulls, for those animals meeting the classification requirements. Animals that do not meet the minimum requirements are rejected.